The soul-stirring celebration of Nelson Mandela’s life – Madiba the Musical — will arrive in New Zealand in just two weeks, paying tribute to the charismatic icon and activist whilst exploring the struggles, racial conflicts and divisions behind his unyielding crusade for reconciliation in South Africa. 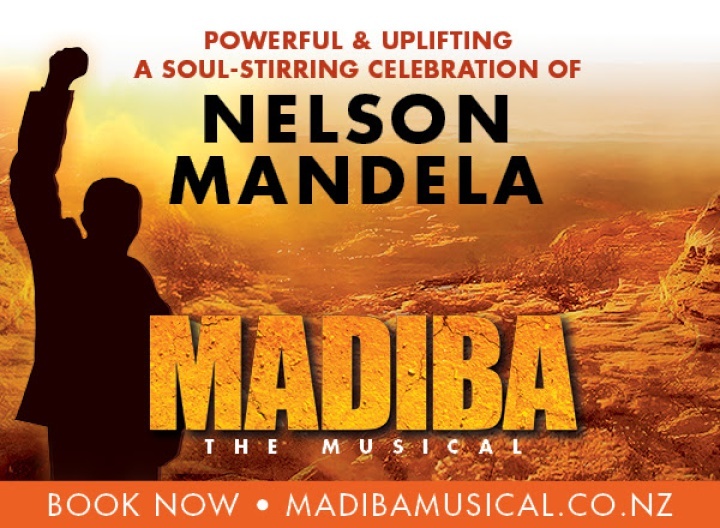 With its pulsating African dance, strident and haunting drama, stunning visuals and inspiring songs, Madiba the Musical is a unique theatrical experience to lift our spirits. Beginning its world tour in France and currently wowing audiences in Australia, this production is interwoven with stories of the fight against apartheid and forbidden love in a troubled land. The musical acknowledges the dramatic part New Zealand played in bringing an end to apartheid. The show features an exciting line up of singers, actors and dancers including New Zealand’s own Barry Conrad who’s opened for the likes of Brian McKnight, Craig David and Eric Benet, toured globally with world-renowned Darlene Zschech and Grammy-winning Israel Houghton, and has vocally produced and penned songs for an array of artists including X-Factor finalist Moorhouse, Ginny Blackmore and StanWalker. His screenwork includes FOX’s Power Rangers: Ninja Storm, numerous TV commercials and the #1 box office hit, The Sapphires. His musical theatre debut was in the Australian premiere of award-winning, critically acclaimed seasons of the Broadway smash, Violet. He toured in Hairspray: Arena Spectacular,Grease: The Arena Experience as Kenickie and recently, Beautiful: The Carole King Musical. The tipping point of Conrad’s rise to public recognition was cemented when he was named as one of the Final 12 on Channel 7’s The X-Factor, winning over a legion of new fans and truly solidifying himself as one of Australia’s most exciting talents. Barry plays Will Xulu who falls in love with white Afrikaans girl Helena (Madeline Perrone, Fiddler on the Roof). In a fictional parallel story to Mandela’s work as a lawyer and activist for peace, their story tells of the struggle and tragedy of the apartheid regime. Following an extensive international search, South African star of stage, television and film Perci Moeketsi was chosen to play his hero Nelson Mandela. From a very humble background where a career in the arts was considered nothing but a hobby for a black child, Perci says he’s pinching himself that he is portraying his hero and on an international platform. Tim Omaji (Fame, In the Heights), also known by stage name Timomatic, plays the role of Sam Onatou, a young black activist who is arrested in South Africa. In prison he meets the man known as “Madiba”, Nelson Mandela. The role of Sandy, Sam’s fiancée, who works for the family of a white policeman will be played by Tarisai Vushe (The Lion King); Peter Van Ledon, is played by Blake Erickson (Les Miserables, Grey Gardens). Following her performance as Shirelles lead singer Shirley Owens in the successful Australian touring production of Beautiful: The Carole King Musical, Ruva Ngwenya plays the role of Winnie Mandela. Directed by Pierre-Yves Duchesne and Dennis Watkins, Musical Director Paul White and Choreographer Johan Nus the musical is timely in its arrival, marking 25 years since the abolition of apartheid in South Africa, and the year that Mandela would have turned 100, if he was still alive.